Yes, It is NATIONAL POETRY MONTH! 🙂 I so love this month. Don’t get me wrong, I love many other months as well. At the end of this April, however, I will be giving away TWO books of poetry. I will ship them to the winners (selected by the random list generator at random.org) in the first week of May. Come on, give a shout out to poetry! It is one of the FEW balms that heals our sore souls as we journey this earth. Check out the writers who started it all many years ago over at The Alchemist’s Kitchen (Kelli Russell-Agodon and Susan Rich) too! 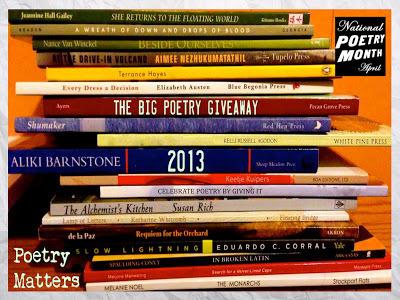 To Enter: Post a comment at the end of this post with your email address and (first) name if you want to be included in the drawing for the poetry books. She is a contemporary poet/writer I most admire and aspire to be like. She takes ancient myth and makes it relevant for our times. You have to chew her work and it may be a hard business, but in the end it’s quite satisfying. I love the connection between classical stories and our times. I believe that our ancient twins experienced the same emotional space as we do– just without our particular technological advances. Though it should be noted that technology has always been faster than the emotional speed of humans. We live at the edge our own comprehension and so did the ancients. I think Anne Carson understands and takes advantage of this truth in her work. 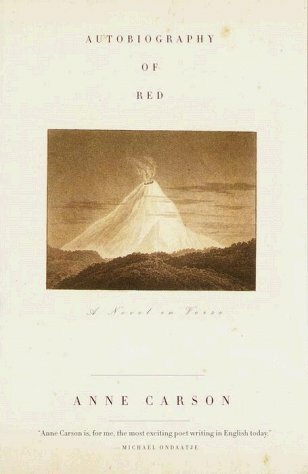 She has just released a continuation to this story– Red doc>. What better than an anthology to whet your appetite for more poetry?! I am a (southern) California poet and am proud to be included in this anthology along with some powerhouse poets from this sunny state. If you enjoy collections and want to experience a kind of California mind this anthology may be for you. Please count me in for your giveaway. I have scribbled for my poetry muse for YEARS, most recently posting on facebook ‘Alexandra J Cornwell – Poet’. Last September I discovered the fun of ‘drabbles’ (100-word microfiction ‘Byron Short Fiction ‘Drabble’ Writers’), although I am finding much inspiration in the non-fiction areas. I suppose it has been my way of blogging, though am thinking now that I’ll have to get my blogsite organized and get on with getting organized to publish some of my scribbles properly. I finally got around to joining my local Bangalow Writer’s Group last week and went to my first readers & writers festival in Bellingen 2 weeks ago (seeing as it was over a 3 hour drive I also attended and entered my first Poetry Slam event while I was there). It is all about getting it out there! @Alexandra– Thanks for signing up! 🙂 Southern California is a fun place to visit — hope you can make it next time. Good Luck in your writing adventures! Fantastic! Count me in, and thanks for doing this!